I was inspired by the Close To My Heart special this month called Pretty In Pink. You can get certain pink themed items at a 30% discount, plus they even created a butterfly mobile craft project that you can order. How fun is that? 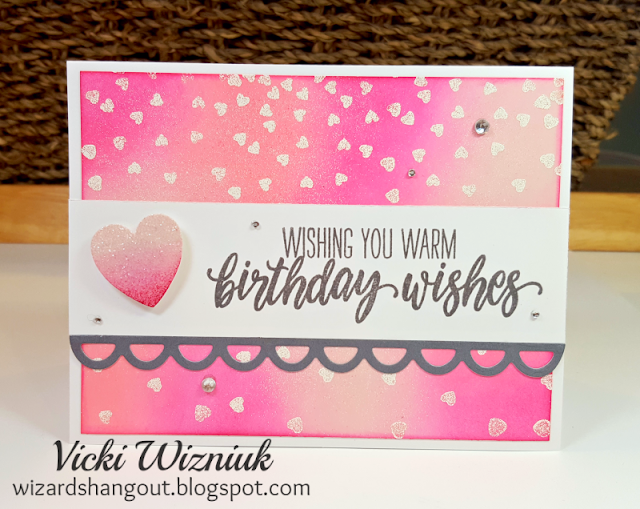 I sponged Bashful, Blossom, and Raspberry onto a piece of White Daisy cardstock to create the colourful background. Then I used the retired Charming Cascades to white emboss the falling hearts over top. The heart was cut with the smallest Hearts Thin Cuts die shape from Bashful Glitter paper, and then I sponged Raspberry ink on the lower half of the heart to give it a ombre effect. The sentiment is from the Sunny Thoughts - February SOTM stamp set. Certainly a fave of mine right now!